It's the story that just won't quit. A few days ago I blogged about Northern Secondary School's bizarre invitation to the Canadian Sugar Institute to come to their "Healthy Hub" cafeteria to, "promote healthy sugary treats". Next came the story from Ryan Storm, a young 13 year old student at Northern who went to CSI's presentation and reported back that after asking a few questions he was told that his questions were no longer welcome. Today I'll be posting the email I received from CSI's Manager of Nutrition and Scientific Affairs Dr. Flora Wang. I'm also posting a follow up email from her as in the first email she states that CSI never asked Ryan to stop asking questions. I found it difficult to imagine a reason why Ryan would fabricate that part of the story and when asked specifically she reiterated that while CSI didn't ask Ryan to stop asking questions perhaps the school representatives who were also present had. We have noted two of your recent blog posts (Nov 10 and Nov 12) and would like to provide important clarification and correct inaccurate information referenced in those posts. The nutrition professionals at the Canadian Sugar Institute were invited by nutrition representatives of Northern Secondary School’s “The Healthy Hub” program to speak about evidence-based information regarding sugars and carbohydrates in the context of a balanced diet. This was an informal session with a table set up in the cafeteria for interested students and focused on the functional roles of sugars in foods, myths and facts about sugars and activities related to nutrition label reading. 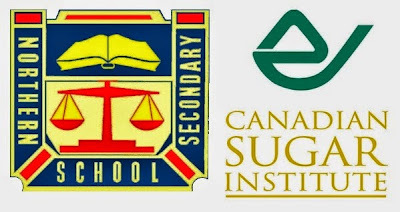 We would like to assure you and your readers that the Canadian Sugar Institute did not engage in any financial or profitable partnerships with Northern Secondary School. The Institute is a non-profit association whose mandate is to communicate science-based information not to encourage/promote the sales of sugar or other specific foods. As such, the Institute was not involved in the promotion or sale of a new banana loaf that was featured in the school cafeteria. We do understand, however, that the banana loaf, prepared by the nutrition students at the school, was in accordance with the strict nutrition standards set by the government for food and beverages sold in publicly funded elementary and secondary schools in Ontario (PPM 150), and was solely a school initiative. The representatives of the Canadian Sugar Institute who were present at the event are qualified nutrition professionals communicating evidence based information. They included one of our Registered Dietitians with a Masters in Public Health, myself (a PhD in Nutrition and Metabolism) and a Masters of Health Science student in nutrition communications. We welcomed all students’ questions and addressed everyone’s questions including those asked by Ryan. We did not ask anyone to stop asking questions and in no way asked Ryan to leave the presentation. We made no statements about Ryan’s interest or curiosity in food and nutrition. After the event, we were informed that Ryan also spoke with school representatives of “The Healthy Hub” program. Science-based nutrition information is a priority at the Canadian Sugar Institute. The goal of our Nutrition Information Service is to inform Canadians about sugars in the context of a balanced diet, and to advocate for nutrition policies and recommendations that are based on reliable scientific research. We kindly ask that you share these important points of clarification with your readers. Happy to share. But need to clarify something. You are in effect stating that Ryan is lying about being told to stop asking questions (or alternatively that he was told his questions would no longer be answered). Thanks for responding so quickly. We are simply stating the facts regarding our communications with students including Ryan. Ryan also spoke with school nutrition representatives that were present. We were not involved in those discussions and didn’t answer any questions that were asked of those representatives. As a result, we cannot comment on the interactions Ryan had with school representatives.